AVOID Derma Roller Scam & Discover the Best Derma Roller Now! A poor quality dermaroller can damage your skin permanently and produce undesirable results. DO NOT buy a dermaroller until your read through my derma roller reviews first. You will 100% thank me for it. Dermaroller can produce amazing skin improvement, and I can verify its effectiveness. I have tried many different rollers since 2007, and I have a collection of them. All rollers look similar, and it is difficult to determine the best one. 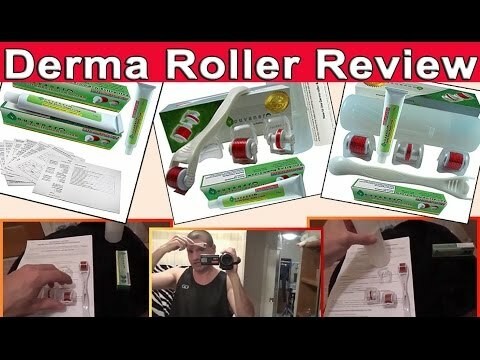 There are very few derma roller reviews available, so I decided to evaluate 10 commonly seen rollers and determine the best product on the market today. Enjoy! I came across this particular roller on Ebay. It was very popular in 2008, and it was sold for $130. This roller is very well built. It is constructed with very solid plastic. It has about 180 needles, and they are made from surgical steel. Although the needles are sturdy, they can rust easily if you dont take good care of them . The needles are widely spaced apart, thus producing very poor coverage on the treatment area. If you are treating fine lines and small scarring, the needles might miss them completely. Also, the needles are somewhat thick, which produce slightly painful treatment. The protective case is cheaply made, and protects the roller poorly. Each roller only comes with 1 needle size with poor instructions. If you prefer different needle length, you have to order another roller for $130. This is an expensive product with too many disadvantages. You can find this roller in many websites. It is sold for $50 – $90. This product is solidly built. It has 192 surgical steel needles. The needles are very durable, and they don’t rust easily. The needles are also widely spaced apart, but they are spaced in a staggering pattern, thus producing an uniform coverage. Compare to dermaroller 1, this specific roller produces moderate coverage on the treatment area. The needles are somewhat thick, which can produce slightly painful treatment. This product comes with a very secure protective case. It protects your roller 100%. Each roller comes with 1 needle size with very poor instructions. You have to purchase another roller for different needle size. This is decently priced product, but it still has a few disadvantages. This is probably the cheapest roller on the market, and you can get one for $15. This is a very poor product. It is made from cheap plastic. It has 100 low quality steel needles. They bent and rust easily. With only 100 needles, this roller produces mild coverage on the treatment area. The needles are extremely thin and produce minimal pain. The protective case is poorly made. It falls apart easily and can break your roller. Every roller comes with 1 needle size with no instruction. You have to pay extra for different needle sizes. This is a substandard product, but it is perfect for short term usage. Dermaroller # 4 are widely sold in many foreign websites for $30. This is another poor quality product. It is made with fragile plastic. It contains 192 steel needles, and they don’t look very high quality. They definitely rust and bend easily. With 192 needles, this roller produces moderate coverage on the treatment area. The needles are extremely thin, which produce very little pain. The protective case looks cheap. It falls apart easily. Every roller comes with 1 needle size with no instruction. You have to pay extra for various needle sizes. This is a cheap product, and it is only good for several treatments. This is the newest dermaroller design, and it comes with LED light. It is sold for $30, and is made with very high quality plastic. The LED light doesn’t really do anything to improve your skin. The handle has a soft anti-slip plastic grip, which is a plus. It has 200 steel needles, but they are extremely fragile. They can bend easily if you roll forcibly or with improper technique, and this can damage your skin. This roller produces moderate coverage on the treatment area. The treatment is painless. Every roller comes with 1 detachable roller head with very poor instructions. You have to pay extra for roller heads with various needle sizes. In my opinion, this is an ok quality product with useless feature. Many rollers can’t reach the surrounding eye areas. This specific derma roller is incredibly useful for treating hard to reach or areas around your eyes. It is sold for $20. It is made with high quality plastic. It has 180 steel needles, but they are extremely thin and fragile. The needles can bend and rust easily without proper handling and maintenance. This eye roller produces perfect coverage surrounding the eyes. The treatment is slightly painful. The product comes with a secure plastic cover. Every roller is sold with 1 needle size with very poor instructions. You have to pay extra for other needle sizes. In my opinion, this is an ideal roller for treating tiny areas, but it is only good for several treatments due to poor needle quality. This is a titanium roller kit, and it is sold for under $30. In my opinion, this is the best product for price and quality value. It is made with high quality plastic and feels sturdy. The product comes with 4 detachable roller heads with different needle sizes. There are 3 roller heads for the face, and one for surrounding eye areas. It also comes with numbing cream, travel case and a how-to guide. The face rollers have 540 needles, and they are of 0.5 mm, 0.75 mm and 1.0 mm needle length. The eye roller has 180 needles of 0.75 mm. The needles are made from the strongest material, titanium. They are extremely sharp, and they don’t bent and rust easily. The needles aren’t too thick or too thin. They are perfect! They penetrate your skin with minimal pain. With 540 needles, this particular dermaroller can product near complete coverage! Unlike many cheaper rollers that are made of cheap, light weighted and thin plastic, the handle of this particular derma roller is made of high quality plastic. You can definitely feel the plastic is more dense and thicker. Your skin roller is 100% protected by a secure traveling case and 4 sturdy roller head covers. The only drawback with the roller cover is that some users couldn’t figure out how to remove it, but if you follow the provided instructions, you will have no problem at all. Since this derma roller comes with various needle sizes, you don’t have to pay extra for a different sized roller. In my opinion, this is a perfect roller. If you can find this product, BUY IT before the seller raises the price! The concept behind this particular dermal roller is very innovative. This microneedling device has a rotating head that can rotate 360 degree. It is suppose to help you peform better treatment around curvy areas. There is one big problem with this roller. Because of the loosely rotating head, dermarolling becomes quite difficult and unstable. As a result, the penetration of needles becomes somewhat ineffective. Few people complained that this can potentially harm your skin because the roller head tended to spin slightly as you roll, thus causing slippage. I actually never had any problems with it. This product is sold for $20 to $30. The handle is made with low qulity plastic. It feels cheap and light weight. It has 600 sturdy steel needles. The roller head is poorly made, and it can fall apart if you press too hard, or maybe I received a defective one? The product comes with a secure plastic cover and a detachable head. The detachable head is difficult to remove. The roller is sold with 1 needle size. You have to pay extra $15 to $20 for a roller head of different size. In my opinion, this product has a great concept, but it is cheaply made and offer unstable rolling experience. You can definitely get a better roller for the same price. Many people have seen this particular roller selling either on Ebay or Amazon. I actually own one myself and tested it. This roller is priced at around $18 to $25. It has 540 titanium needles. The needles are actually quite well made, but the handle is made of low qulity plastic, and it feels light and cheap. The product comes with 1 clear plastic travel case. It falls apart easily. You need to be careful when handling it, or you can drop the roller and damage the needles. It does not have a detachable head. Therefore, you need to pay an extra $18 to $25 for a different sized roller. If you need 3 different rollers, you will be paying over $60! It doesn’t come with very good instructions either. In my opinion, this is a good product, but you can definitely get a better roller for a few more bucks. I recently bought this detachable roller kit. I was very impressed with the quality of this product, and I was surprised. This kit is about $29 to $35. It has 3 roller attachments with 540 and 1200 needles. This is the only kit that has an extra large attachment with 1200 needles, and it is perfect for body treatment. The needles are stainless steel, and they are very well made. This particular roller has a special release button. You press the button, and the attachment will come off easily. This is a great feature. The kit comes with 1 clear travel case, and it falls apart easily. You must be careful when holding it, or you will drop the roller and bent the needles. It also comes with 2 roller head covers. The only problem I had with this product is the handle. It is hollow and made of very thin plastic. It feels light and cheap. In my opinion, this is a really good product, and I do not see anything wrong with it except the lack of good instructions and numbing cream. The “540 Titanium Needles Detachable Derma Roller Kit” is now available on Ebay.com. You can click Buy Now Button below to visit Ebay.com. This is a FREE comprehensive guide on dermaroller. Topics include: 1) What is skin needling 2) How to use the derma roller correctly 3) What is the perfect roller 4) Where to buy a roller. Warning: DO NOT derma roll without proper instructions. You can damage your skin. Discover proper instructions on 1) how to dermaroll correctly 2) How frequent to use your roller 3) 4 common side effects 4) How to handle and clean a roller. Which is the Best Derma Roller Needle Size with Fast Result? Studies show that skin needling can stimulate collagen regrowth. Many people reported noticing skin improvements in only 1 treatment. How does derma rolling work? Get the latest facts now! Many users reporting seeing a reduction in wrinkles, scars and stretch marks. Does skin needling really work? Discover 7 MUST KNOW facts before derma roller treatment. A cheap roller can damage your skin and cause infection, but a high quality roller can produce amazing result in only 1 treatment. Learn how to pick the best product now. Learn how to pick an ideal derma roller and discover the best place to buy one. Is skin needling painful? Does it make you bleed? How often do you derma roll? Discover top 10 questions and answers now! Should you try micro needling? 8 important complaints will help you decide. No more spending money on expensive chemical peels and microdermabrasion. Derma roller changed all that! I create this article because I have heard many negative derma roller complaints. I own and have used all products presented here. I hope these 10 derma roller reviews will help you become a smarter consumer. Hi! I wanted to get some tips from you on derma rolling. I started using a titanium 1mm roller in August. I have used it once every 3-4 weeks since then. My goal is to brighten my skin, give it a youthful glow, minimize some fine lights and tighten some sagging (I am 28 and a redhead and spent some considerable amount of time “tanning” from 18-20). I really have not seen any results since August, the aesthetician I ordered the roller from said it could take 6-7 months for results to show and I’ve read online it can even take up to a year. Was this true for you? How long did it take before you saw good results? The answer is Yes and No. Your result is depended on several factors. They are 1)age 2)Severity of your skin condition 3)How often you derma roll (sometimes more is not better) 4)How fast does your body heal (everyone is different) 5)Needle size (longer isn’t always better) 6)Your health condition. Average people can see result in several treatments after the peeling process, thus revealing new and youthful skin. If you have moderate to severe scarring, then you should expect 6 to 7 months to see improvement. For basic rejuvenation, I usually see result in just 2 treatments after the peeling process. For my moderate acne scarring, I saw major improvement only after 6 months with 1 treatment per month. I also had 2 TCA Cross treatments after 1 year of dermaroller procedure to completely remove all scarring. Also, you can use 0.25mm every other day to drastically boost the effectiveness of your favorite skin care product, thus speeding up result. I began using the product in January and started seeing results after just a few months. I began increasing use to twice a week. I have old stretch marks from childbirth and they were dark. They have shrunken appearance and are no longer dark. I have carried the scars around for years and am quite pleased with the results. Without expensive surgery and painful lasers, I was able to treat the stretch marks at home in under a few minutes per week. This is an excellent product and I highly recommend it’s use. I am mid-thirties and the mother of a teenager. Why is the german dermaroller so much more expensive? It was expensive around 2006 because there weren’t many manufacturers back then. Now you can get the similar quality roller with lesser price. Hi can I do derma rolling on a portion alone rather the whole face.. Eg forehead alone. I have not tried it. This is the first time I am planning to do. I am going to do Myself at home.. I am scared as I have no experience in dermarolling..
You can definitely do the portion of your face with problems. There is no need to do the entire face. Also, if you are afraid, you can do it in a clinic or you can just start out with 0.25 to 0.5 mm roller. All the information keeps saying use a good moisturizer and sunscreen. But no one recommends any of the names. Can someone please give the names of several good ones? Also, I understand one can use a good mineral powder the day after. I use the Jane Iredale mineral loose powder. Is this better than using the the liquid? I personally do not use moisturizer because many can clog pores. I only use hyaluronic acid serum. You do not really need to use sunscreen if you treat your skin at night before bed time. Also, many sunscreens are very thick, irritating or comedogenic. You really should wait 24 hours before usage. For mineral powder or makeups, you MUST also wait 24 hours before usage because they can further irritate your skin. What problems are there using a derma roller, while taking antidepressants. Some antidepressant can slow down the healing process. Have you had any experience with using the derma rollers for stretch marks and scaly skin? I am not sure about scaly skin. If you have abnormal skin disease, then you shouldn’t use it. For stretch marks, it should work. Depending on the severity of your stretch marks, you need 3 to 12 monthly treatment to see results. For stretch marks on the stomach what mm derma roller do I use? 1mm? It depends of the depth of yoru strech marks. If you are unsure, you can just use 0.5mm. 0.5 can achieve the same results of 0.75 or 1.0 except you need more treatments. I have acne scarring and was thinking of getting the Derma roller for a long time now. My scars are not sever but my pores are somewhat open. Do you think the Derma roller will work for me? I have sensitive and oily skin btw. Rolling can improve your scars but not 100% effective on your pores due to their tiny round shapes. Rolling is more effective for rolling and boxcar scars. It might not be 100% effective for pitted scars. Please read my article on “Acne Scars” on top menu. It will explain everything for you. I am currently looking into purchasing a derma roller and have found the La Fontaine roller and Banish roller to be most appealing, but I do not know which is the most effective and highly recommended. After researching, it seems that finding reviews for each is quite difficult. Do you know anything about either of these rollers? I would be using the roller on my face for fine lines and on my body where I have stretch marks I greatly appreciate your opinion. I actually have rollers from La Fontaine and Banish. I received La Fontaine roller as a gift. It is yellow and has a clear case. Banish roller is white and purple. They are quite similar in appearance. They both have 540 needles. They are both good products with solid constructions except Banish roller comes with topical serum. If you don’t need topical serum, La Fontaine is a better price option. If you are treating your face and body, then the roller may not last as long. Most rollers do not last long for body treatment. I think you should use La Fontaine roller for facial treatment only. Thank you very much for your response. Would it be better to buy two rollers than? A .5 for the face and .1 for the body stretch marks, that way I’m not wearing them out and they’ll last longer. Plus, I am planning to use a numbing cream on the stretch marks that way I could get into them a little deeper. I am definitely looking to treat both areas though. I know there are kits with different roller heads that are interchangeable, I’m just not sure which are top quality amd which Brand is the best for this type of kit. Please let me know what you think. I appreciate your collaboration. You mean 1.0mm roller. I don’t think there is 0.1mm roller. Yes, you can definitely get 2 rollers. If you are treating your body, numbing cream is not really necessary because your body has thicker skin, and you probably don’t feel anything except getting some mild redness. Stretch marks are difficult to treat especially on the body due to thicker skin. If you have “severe problem”, rolling may not be effective. You probably will need invasive treatment such as Laser, etc. Please note that you will not get immediate results especially for stretch marks, and it may not completely remove them. Some people had about 6 months of monthly treatment before seeing results. If you really want to know everything about rolling, I suggest you to read “The Concise Guide to Dermal Needling” by Dr Lance Setterfield or “Holistic Microneedling” by Anthony Kingston. They will explain everything in details. Can you please clarify what you mean about not using it on acne? I’m in my early 30s and keep my acne well controlled with a prescription, some vitamin c serum and a great moisturizer I discovered after my vi peel. I do get occasional breakouts, but can’t imagine everyone who uses a dermaroller has perfect skin all the time. I ordered a .5mm dermaroller that I’d like to use on the beginnings of smile lines I see. I want to use it with some sort of anti-aging serum bc it’s supposed to be so great for absorption. Is this a problem? You can still use a roller if you have acne, BUT you ” Should NOT Roll Directly INTO” the pimple. Rolling into the pimple can pick up bacteria and spread it across your skin. You should roll around it. Mild breakout is quite normal after chemical peel because the peel can irritate your skin. You can apply topical product after a treatment, but it “CAN NOT” contain irritating, toxic or comedogenic ingredients such as glycolic acid, salicylic acid, hydroquinone and etc. If your product has undesirable ingredients, applying it immediately after a rolling session will also boost the negative effects of these harmful ingredients. If you are unsure about your topical product, you can use it when your skin is recovered. I can’t find information anywhere about what I can use after a .25mm roller as far as product goes. Most specifiically, can I use retinol right after using .25mm? Also, I know one should avoid potentially harmful ingredients like parabens when using .5mm and above because they will go into the blood stream, but what about 0.25mm? That length doesn’t cross the blood barrier so are these products okay? Also I’m getting conflicting information on using one with rosacea. I have very mild rosacea so can I got up to 1.0mm safely? If you are talking about retinol such as Retin-A (tretinoin), then you can use it. Please Note: Retin-A aka tretinoin can cause redness, peeling and sun sensitivity, please use a little bit at a time and start out with the lowest concentration of 0.025%. Also, You should avoid using topical products with harmful ingredients immediately after a rolling treatment. This is for all roller size including 0.25mm. For rosacea, if you have nodular or pustular rosacea, you should not use a roller. Otherwise, you should start out with ONLY 0.25mm before jumping into 1.0mm because you want to make sure you are not hyper-sensitive to rolling due to your skin condition. Derma rollers are not sophisticated tools. They do not require specialized materials. They are simple to manufacture, and simple to use, too. That means that you can get a good quality derma roller for anything from $29 to $49 per piece. But, you should exercise prudence in selecting which derma roller brand to buy. You can get “burned” by choosing inexpensive and ineffective brands that do not produce any visible results, or may even worsen your current skin condition. Can you please describe the peeling process? When it happens and what to do and what not to do with it? I haven’t seen it explained anywhere in the Internet. The peeling process is extremely mild, and your probabaly won’t notice it until you wash your face. You will notice a very mild flaking of your skin when you start rubbing your face with a cleanser. Also, 0.25 will not cause flaking/peeling. I’m 46 yrs old and I would like to try using a roller for neck wrinkles and sagging. Which roller size should I use to target the neck area? You should start out with 0.5 once per month until you are fully comfortable with rolling. I am purchasing derma roller, what should i do after i roll? Can i wash my face with a warm water or i need an hour before i wash? And do i need to use moisturizer or serum? You should clean off all the residues after a treatment with a cleanser or alcohol, and you are done. Applying topical product is strictly optional. Hi, I am considering trying out the derma roller for the first time. I have seen many advertisements online and have read your reviews on the different products you have tested out. I am interested in the kit that comes with different size rollers as well as the numbing cream (which I am sure I will need). My reasoning for trying derma rolling out is for dark spots on certain areas of my face mainly my cheeks and I want to try it on my light/mild stretch marks that I have on my hips/rear end. Do you think that certain kit would be the best for me since I have various size areas I want to use it for? Also, which size would be good to use for each area I plan on treating and how ofter should I use it on those areas? You really should start out with only 0.5mm, and use it once every 4 to 6 weeks. Some people jumped from 0.5 to 1.0 and higher, and they freaked out when they experienced redness and irritation. It is best that you use 0.5mm until you are fully comfortable with rollnng and understand how your skin reacts. Hi I’ve been reading ur site like a thousand times..usin it as my guidelines.. been using derma roller since Dec 30 2016.. I’m seeing little results but still hoping for more. I’m just wondring how long before u could wash your face after rolling? Like how many exact hours ? Bc I derma roll in the morning since I’m just a stay home housewife. Is 8 hrs enough? You can wash your face immediately after the treatment, but you shouldn’t use harsh cleanser to irritate the skin. I have had a filler done on my face 2 weeks ago. Is this safe to use with facial fillers? Most people recommend waiting 2 to 4 weeks before using a roller because you want to wait for the swelling and redness to disappear from the filler treatment before anythhing else. Personally I can not give you my own advice because I never had filler done. I had bottox and fillers two years ago, and I now use derma roller. I have heard that you shouldn’t use derma roller if you had bottox and fillers done, please advise. I like using it and I only use 0.2 and use it every day cuz my skin likes the feeling when I use my skin care products, but I’m just concerned about my having bottox and fillers last two years ago. I have only used it three consecutive nights. Thank you for your coming reply. You should not use a roller for several weeks (ex. 4 weeks) only after your bottox or filler treatment. If you are unsure, you can roll around the treatment areas and not directly into them. I am looking for a dermaroller that can be used on hips and thighs. Not only do I have cellulite but stretch marks. Is there one? If you have a large area to treat, you should get the large roller (really wide one). Otherwise, you can use the regular one. If you are using tretinoin with rolling via 0.25mm or higher, it will boost absorption of tretinoin, thus improve result. BUT it can also increase the common side effects from tretinoin such as redness, hypersensitivity to sun and irritation. I don’t think you need rolling treatment at your age. Tretinoin is definitely enough for you without rolling. Also, you really should use 0.5 ONCE every 4 to 6 weeks. Can the roller be used on the leg as I have some sun spots? After much consideration, deliberation and research, I derma rolled for the first time, with a 0.5 mm titanium roller, last Monday. From what I had read, some women were saying that derma rolling was somewhat painful and that they had to used a numbing cream, but I was thrilled to find that there was hardly any pain and minimal redness. When I got through, I wondered if I could derma roll twice a week, instead of just once, to accelerate the results, but when I asked my skin consultant, she said that it was better if I just rolled once a week to let the skin heal, but that I could use a 0.2 mm for rolling daily for better absorption of growth creams. Would it hurt if I derma rolled with the 0.5 mm roller twice a week? Thank you for reading my question. In general, you really should use 0.5 once every 4 to 6 weeks. Average people do not need multiple treatment of 0.5 per month. More is not better. On the other hand, you can use 0.25 to boost absorption of topical product, thus improving results. Thank you for your response. I’m not average, I’m 70 years old, but my face isn’t showing it yet. I do want to tackle the fine lines, while they are still manageable. I do appreciate your advice, however. Thank you! Hi, I have keratosis pilaris on my both arms and on the chest. Can derma roll cure my problem? If yes, what type of derma roller needle is good? Please answer my question. Thank you! No, Keratosis pilaris is an abnormal skin condition. Rolling can not fix it. You need to ask your doctor before using a roller. Hey, my son has the same thing. The ONLY thing I have found that works wonders in a matter of a few days to see drastic results..*drum roll*.. organic virgin coconut oil! I lather him up once to twice a day and his chicken skin has reduced 75% in a week. Its still there, but he isn’t as ashamed to have short sleeves and shorts on. There are no brand names on all the derm rollers except the one I can purchase through eBay/Amazon. 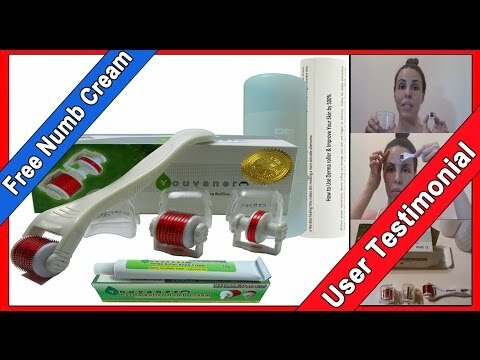 I can’t click on any links to any of the products in your Unbiased Derm roller review? I can’t post up the brand names. You can tell by looking at the pictures. You can also try Dr Roller or Environ Roller. They are good quality also, but they are non interchangeable and little bit more expensive. What are your thoughts on Dr. Pen as it appears to offer the best options, being able to have all needle sizes? It’s a lot more expensive but sometimes you get what you pay for. Most micro needling gets good reviews but I’m scared because several people said it ruined their skin, even when done professionally. I actually have 2 electrical needling pens. They are pretty good except they can only cover a tiny area (the size of a penny). Also, you have to attach them to a electrical socket. Since the movement of the needles is controlled by a electrical motor, you have to use it carefully in order to avoid overtreating your area. On the other hand, you have full control of the roller, and you dictate the speed and intensity of your motion.